Writing in the Journal of Broadcasting & Electronic Media, Ruthann Weaver Lariscy of the University of Georgia argues that "Communication journal editors and concerned participants in the system should implement a policy that assures non-U.S. generated communication scholarship report procedures for assuring the protection of human subjects, the use of informed consent, and compliance with comparable IRB protocols." Lariscy notes that IRB review degrades research. She recalls helping to plan a study of eighth-graders in Georgia, only to find that "the human subjects protection protocol required for this study made the research more difficult and depressed response rates," so that she and her colleagues got a participation rate of only 30 percent. In contrast, she refereed a study--apparently done abroad without IRB intervention--which got a participation rate of more than 85 percent. "I am left to conclude that IRB controls may have a considerable impact on our data collection, and the claims we make based on the data," she writes. She does not claim that such IRB restrictions protect participants in communication research. To the contrary, she applauds the Illinois White Paper's position that "not all methodologies require the same rigorous overview and approval by IRBs, and that procedural changes should be made that acknowledge such methodological and content area differences." 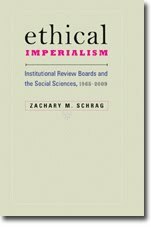 If IRB review is degrading research without protecting anyone, why does Lariscy want journals to impose it on scholars who are currently free of such review? First, she argues, "Failure to have uniform reporting requirements tarnishes the blind review process. Once a reviewer can identify that a piece of work originated either domestically or internationally, there is potential for bias." Well, yes. But there are dozens of factors that can flag a manuscript as originating outside of the U.S., including the spellings of words, the places studied, the literature cited, and even the proportions of the document. (While I am doing less work on paper, I still notice when a manuscript is formatted for A4.) This is a pretty thin benefit for a significant cost. And a cost-free alternative exists. Journals could ask that U.S. authors omit descriptions of human protections procedures from their submissions, just as they now omit their own names. This would retain blind review without destroying data. Bad as her first argument is, Lariscy follows it with an even worse one: "A non-level playing field exists for those of us conducting human subjects studies in the United States compared to the relative ease of conducting similar studies elsewhere." In other words, IRBs are wrecking our research, so let's be sure they wreck everyone's else's. If Lariscy wants to make the case that journals should insist on IRB review of non-U.S. research in order to protect children, then let her do it. But it is unworthy of a scholar to advocate interference with research for the sake of interference itself.